Stephen Colbert had plenty to say when it came to the allegations of sexual misconduct against his boss, CBS CEO Les Moonves. 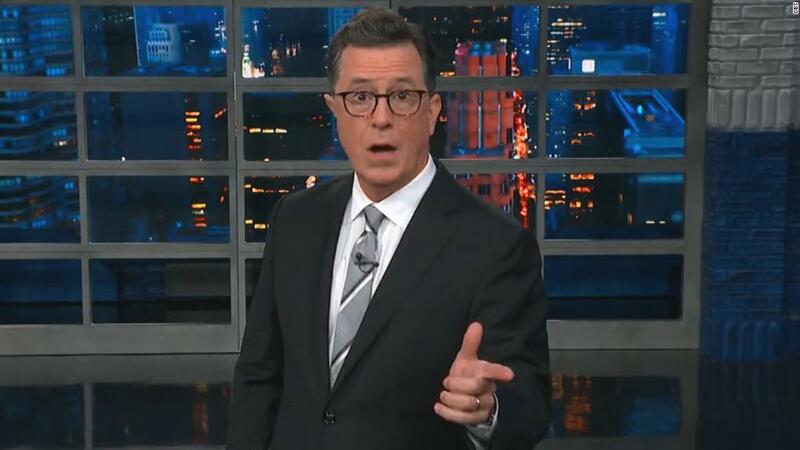 Colbert kicked off CBS' "Late Show" on Monday night joking that he heard over the weekend that there was an article about Moonves in the New Yorker, but acted as though he didn't know who wrote it. Once he found out that it was Ronan Farrow, Colbert spat out a sip of a drink he took from a coffee cup. "That's not good," Colbert said. "Ronan isn't exactly known for his puff pieces about 'glamping.'" Later in the show, Colbert spoke more about Moonves and the #MeToo movement from his desk. "It's strange to have to say this, powerful men taking advantage of relatively powerless employees is wrong," the host said. "We know it's wrong now and we knew it was wrong then. And how do we know we knew it was wrong then? Because we know these men tried to keep the stories from coming out back then." Colbert then said that as a "middle-aged guy with some power in the entertainment industry" he may not be the ideal person to address "this kind of systemic abuse," but that he does "believe in accountability." "Everybody believes in accountability until it's their guy, and make no mistake, Les Moonves is my guy," Colbert said. The host then pointed out how Moonves hired him and has stood by the show. "But accountability is meaningless, unless it's for everybody," Colbert added. "Whether it's the leader of a network or the leader of the free world." Six women told The New Yorker that Moonves sexually harassed them. In a statement to The New Yorker that was also obtained by CNN, Moonves said he has "promoted a culture of respect and opportunity for all employees" throughout his tenure at CBS. "I recognize that there were times decades ago when I may have made some women uncomfortable by making advances," Moonves said. "Those were mistakes, and I regret them immensely. But I always understood and respected — and abided by the principle — that 'no' means 'no,' and I have never misused my position to harm or hinder anyone's career." Media observers played close attention to how CBS reacted to the news all day on Monday.